Videographer Brandon New did a great job capturing Liz & Brice’s big day, from their wedding at Christ Church Cathedral on Monument Circle to their huge celebration at the Indiana Roof Ballroom. Liz enjoyed a sweet first look with her dad before the ceremony, and the music during the wedding was highlighted by an amazing choir right alongside the cameras in the balcony. The ballroom at the Roof looked simply gorgeous with flowers by McNamara Florist and a cake by Classic Cakes, and the always-awesome Zanna-doo rocked the guests all night long, with a little help onstage at one point by Liz & Brice along with a few little party starters. Thanks to photographer Shane Rodimel & the Leslie Jones Weddings team for being great to work with, and huge thanks to the Indiana Roof Ballroom for the referral! Ashley & Josh took over every nook and cranny of the Scottish Rite Cathedral for a truly epic wedding day. The ceremony was moved indoors due to a rainy forecast, but Gene Huddleson (who referred this fantastic event to us) and his Detail+Design team executed their backup plan to perfection, with the Evans Audio Visual gang helping to bring more than a touch of the outdoors with them. The orchestra by Encore Entertainment set an elegant tone for the ceremony, and Ashley’s stunning dress was a highlight in itself, judging by the reaction of the crowd. The reception decor in the ballroom was equally jaw-dropping, with an eclectic medley of tables (including some cool new ones by Wow Factors) and towering centerpieces surrounding a majestic cake by Classic Cakes. Photographer Hether Miles and I had a field day capturing all this splendor. The service by Thomas Caterers was spotless as usual, and the R&B music by the Chicago Catz was purr-fect for this party crowd. The “afterglow” in the South Lounge concluded the evening with a fun club vibe, complete with an outdoor cigar lounge. 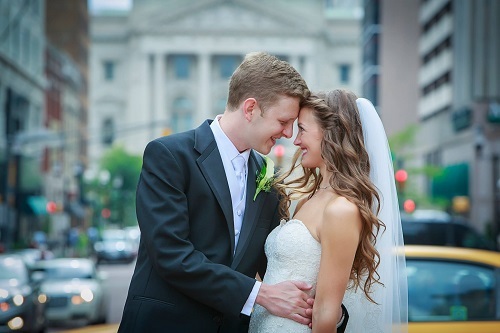 Lauren & Ryan are a wonderful, faith-filled couple who exchanged vows at Second Presbyterian Church before celebrating their union at D’Amore Indianapolis. Coverage started with the rehearsal, followed by a fun, Texas-sized hoedown dinner in a full-sized basketball gym on a relative’s property. The wedding day was filled with moments both surreal & magical, from the way a gust of wind lifted Lauren veil right off her head to a moving moment of prayer while holding hands without seeing each other prior to the ceremony. The reception was filled with surprises as well, my favorite of which was Ryan (a college quarterback) removing the garter from Lauren…with a football wrapped in it! 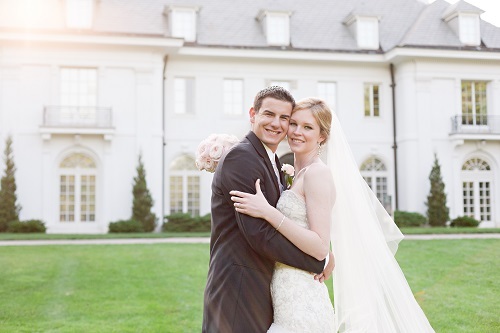 Kudos to an amazing vendor team, including photographer Shelly Valentine, Palmer Kelley Designs, the Thomas Caterers team, Heavenly Sweets, Indy Photo Booths – and especially Wedding Entertainment Director Jim Cerone and planner Jeanne Milan, both of whom referred this All-American couple to us.